Home SEO What is Organic Traffic and SEO? In the world of digital marketing, it’s almost impossible not to hear the words “organic traffic” and “SEO” being thrown around, but what exactly are these terms and why are they important in building your brand? In this post, we will break down these buzzwords and show you how your simple Google searches actually contribute to the entire system. To understand organic traffic, we first have to know its opposite — paid traffic. Paid traffic (also known as Pay-Per-Click) is any visit to a website that was bought via advertising. So in contrast, organic traffic refers to any one visit to a website that was not paid for. It’s called organic because the visits are natural and did not require any paid efforts to push a visitor to the website. Organic traffic occurs when a user visits a website after using a search engine (Google, Bing, Yahoo!, etc). In fact, there are several channels to bring about traffic to your website. We’ve already covered two — organic and paid — so let’s cover two more. Direct Traffic occurs when the exact web address (URL) is typed into the browser or a bookmark is clicked. Referral Traffic happens when traffic comes from outside search engines. The website could be linked by websites such as forums, blogs, news portals, info sites, etc. 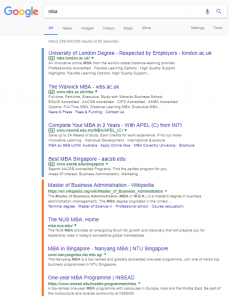 How Do We Differentiate Between Paid Ads & Organic Search Results? The image below is a typical search result page you will see when you perform a search on Google. In most circumstances, you will see 1 to 4 top results with the green ad icon, which tells you that this entry is a Google Ad. The remaining results are organic entries ranked by the Google algorithm. Search Engine Optimization, or SEO, is a marketing effort which works to improve the visibility of a website on organic search engines. SEO works alongside search algorithms to improve a website’s organic ranking on the Search Engine Result Page (SERP). At this point, you may be thinking that since paid ads are located at the prominent position above organic results, does your business even need SEO? It saves your advertising budget while you receive tons of free organic traffic. If your website is loaded with content, an effective SEO strategy can maximize your website’s visibility and outrank your competitors. Your business will have higher credibility, stronger brand impression & awareness online. It focuses on long-term profitable keywords (words that many people use to search for things online) and is more accurate to location and context. If you manage to be ranked on the first results page, it will increase click-through-rate and improve conversion rate indirectly. When it comes to the most effective strategy between paid search and SEO, the best strategy is an integrated one. Based on Nielsen Research, brands can attract 92% total clicks if the brand name appears in both the organic and paid search results. In contrast, only appearing in the organic results yielded only 60% of clicks. An integrated approach allows both Paid Media and SEO to work hand-in-hand to give your business more awareness. You can see instant results with Paid Media while SEO works on helping your website climb rank in the long run. Paid Media is suitable for seasonal or short-term promotional campaigns to generate awareness and action. On top of this stronger branding ad campaigns have been seen to indirectly help SEO traffic to increase. While you can bid for a variety of keywords with Paid Media, there are some words which are not allowed to be bidded, and this is where SEO comes in. For example, the medical keyword “Botox” is not available via Google Ads. An integrated approach saves you money by reducing the ad campaign’s over cost-per-click because of the optimized landing pages. Some keywords are costly to bid for and SEO campaigns can be used to increase leads and quality conversions organically instead. Hopefully, the above article has helped you to get a better grasp of what organic traffic and SEO is all about! Biam Hong is an SEO specialist at SearchGuru. As a psychology graduate, he has an interest in understanding the search intent of users through their search behaviour.